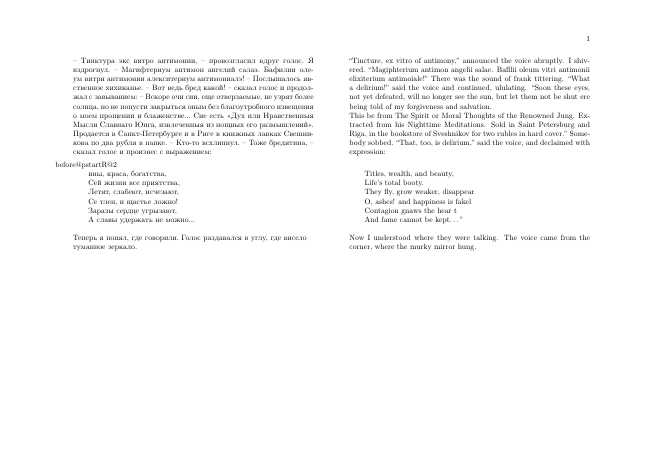 I have both verse and prose in my Russian-English bilingual book (I use reledpar/reledmac). Russian side has weird characters before the verse when I trying to set it up with astanza: "before@pstartR@2". Moreover, the first character (Ч) in the verse disappears after the compilation - but all of this happens only for Russian (left) side. How can it be fixed? “Tincture, ex vitro of antimony,” announced the voice abruptly. I shivered. “Magiphterium antimon angelii salae. Bafllii oleum vitri antimonii elixiterium antimoiale!” There was the sound of frank tittering. “What a delirium!” said the voice and continued, ululating. “Soon these eyes, not yet defeated, will no longer see the sun, but let them not be shut ere being told of my forgiveness and salvation. Now I understood where they were talking. The voice came from the corner, where the murky mirror hung. I updated reledpar and reledmac packages, and the problem disappeared. For those who use OverLeaf, you have to download .sty files from the TeX Live sources here: http://www.tug.org/texlive//devsrc/Master/texmf-dist/tex/latex/reledmac/. Not the answer you're looking for? Browse other questions tagged reledmac verse reledpar parallel-texts or ask your own question.